Larimar is certainly one of my favorite gemstones, and I am convinced one of the reasons I'm on this earth is to talk about and spread this lovely mineral around! Which may not be a bad idea, considering one of Larimar's many reputed powers is its ability to heal the Earth. 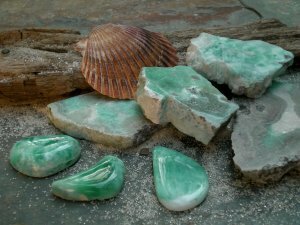 Often referred to as "Caribbean Turquoise," "Dolphin Stone," and "Atlantis Stone." Larimar is a stone of volcanic origin found only in the Dominican Republic, near the city of Barahona, in a region called Los Chupaderos, which is located in the south west portion of the country. It is actually a blue variation of the white mineral pectolite, a stone that formed as a result of mineral deposits beings pushed into tubes or "chimneys" inside volcanoes millions of years ago. White pectolite is found in the United States and Canada. It has been speculated that volcanic ash settling on the molten rock may have caused the beautiful blue coloring, which varies between electric "volcanic" blue, to whitish, greenish, and red, the latter formed as the result of iron inclusions. Certain finds of amber in the D.R. also have a lovely blue coloring that reflects from the fossilized sap in the sunlight, this is also believed to be the same type of volcanic ash phenomena. Several colors are usually found in each stone, and grading for Larimar is difficult, since the coloring and patterning are so varied. A Larimar specimen that has some translucence, chatoyance (reflective quality similar to that in tiger eye) and beautiful patterning can be considered as valuable as a deep "volcanic" blue piece. Generally, pieces with the black/red iron deposits and the murky greenish colorings are not considered as valuable. Larimar, with its wild patterning, often has "pictures" or random images throughout. Some pieces cut directly through the center of a column depict what appears to be angels with their arms outstretched. I often wonder about the term "Dolphin Stone" regarding this mineral, but its interesting how many dolphin like images I have noticed in certain stones. I have a lovely large pendant that was made on the island; I'm always amazed how many people notice the dolphin image within it. A lot of the Larimar I have in stock now has what looks like people, owls, butterflies, and hummingbirds in them. Its great fun to look into this stone to find the hidden pictures. 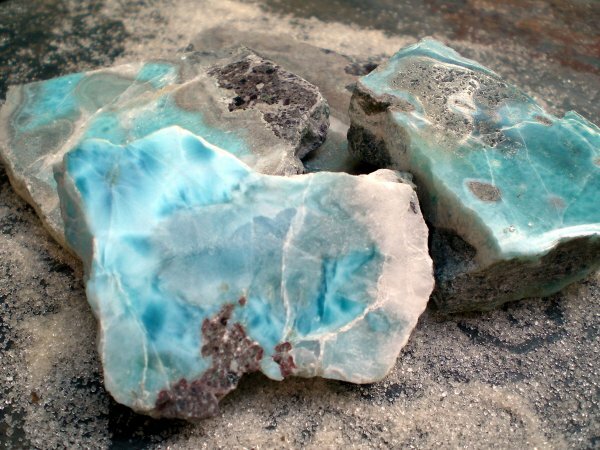 Larimar was originally thought to be discovered around 1916. This is the first documented evidence of the stone, although native tribes may have utilized it, they were known to decorate their clothing with amber found on the island. The 1916 papers showed that a priest had petitioned for mining rights, but the plan did not materialize. It was rediscovered in the 1950's by local fisherman, who believed the azure gem originated in the ocean since it was first discovered there. In 1974 an American Peace Corps engineer named Norman Rilling and a Dominican Republic native named Miguel Mendez found the curious blue stones along a beach. Mendez, being the stone's discoverer, named it for his daughter Larissa, and the sea, mar, hence the name we know today as Larimar. It quickly caught on with locals and tourists, and its origins were traced to the extinct volcanoes in the mountains of Barahona where mining began. This wonderful mineral may have escaped human eyes if not for the fallen stones that made their way to the ocean via the streams and rivers, perhaps nature's way of making sure this gift would not go unnoticed. 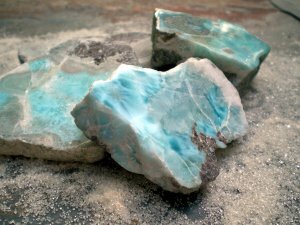 This mineral is mined in the most rugged remote, and dangerous conditions, since the "chimneys", or vertical shafts where the Larimar lies waiting have to be discovered, then approached with merely shovels and pick axes. Mines consist of a network of narrow, interconnecting tunnels, many not much wider than a human body. Larimar miners are brave, sturdy men that risk losing their lives as the result of the makeshift mines caving in. During rainy conditions, the mines are filled with water, and mining ceases. This, along with the demand by seasonal tourists, and the uncertainty of future deposits, causes the price of Larimar to fluctuate like a commodity. This is one of the few semi-precious stones investors recommend, believing that the value can only increase, unlike the more abundant gems such as Amethyst.